We are so excited to get to share more about Disney Dreamers Academy! This year marks the 11th year of Disney Dreamers Academy with Steve Harvey and ESSENCE Magazine. 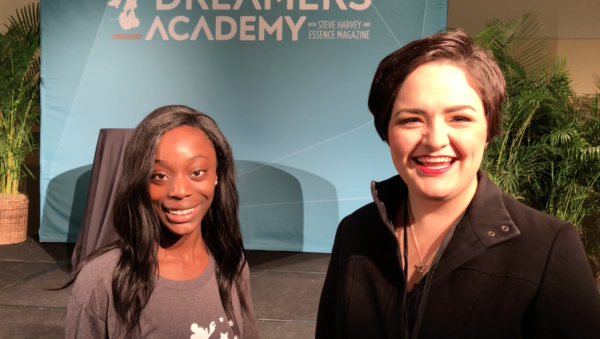 Since 2007, Disney Dreamers Academy has been creating a unique mentoring opportunity for students between the ages of 13-19 to come to Walt Disney World and learn how to dream big! While at the Press Conference, we got to learn more about how passionate ESSENCE, Walt Disney World, and Steve Harvey are about giving back to the community and inspiring the future generations. It was truly inspiring! In addition to inspiring the students to dream, DDA also presents hands on learning experiences and workshops to encourage and guide these Dreamers into a path that helps develop the skills needed to succeed in their chosen career paths. Featuring speakers such as Steve Harvey, Yolanda Adams, Carla Hall, and even Bishop T.D. Jakes, the Dreamers get real-life inspiration and guidance to help their dreams flourish. Each year, 100 students are chosen to participate in this amazing, once-in-a-lifetime opportunity that takes place where dreams come true. We had the opportunity to chat with two of the local Disney Dreamers about what it means to them to be a part of this amazing opportunity. First, we got to chat with Eamilia, who dreams of being a pediatrician for children with special needs. She is such a sweetheart! We later got to chat with Malachi, whose dream is to become a surgeon to help those in need. He is so kind and focused! After the press conference, we were able to see this year’s Disney Dreamers in a special parade to celebrate their dreams coming true at the Most Magical Place on Earth. Watch the video below! Holding signs with phrases such as, “Dream on purpose. Dream Big!” and “Great risk. Great reward!” you could feel the positive energy and excitement in the atmosphere! We even got to see Steve Harvey himself in the parade! After the parade, we were able to listen to Steve talk about inspiring the next generation to dream big, and how each of us must have a dream to inspire our lives. It was truly an amazing day, and I cannot wait to see the amazing things that lie in store for each of these incredible Disney Dreamers.